Eric is currently flapping his way back to us! When we last updated you about him on the 19th of March he was making for the Portugeuse coast. He hit the coast and continued north to Figueira da Foz where he remained until the 30th of March. In the last week he has steadily been making his way north following the coast and crossing into Spain on the morning of the 31st. He has stuck tightly to the coast all the way to Foz in the north where he arrived at 2048 on the 3rd of April. He spent the next 24 hours fuelling and resting up before heading off at 2018 on the 4th of April along the coast before flying over to the wee island of Las Pantorgas at 0823 yesterday morning (5th). He stayed here until 1231 before making the epic crossing of the Bay of Biscay. 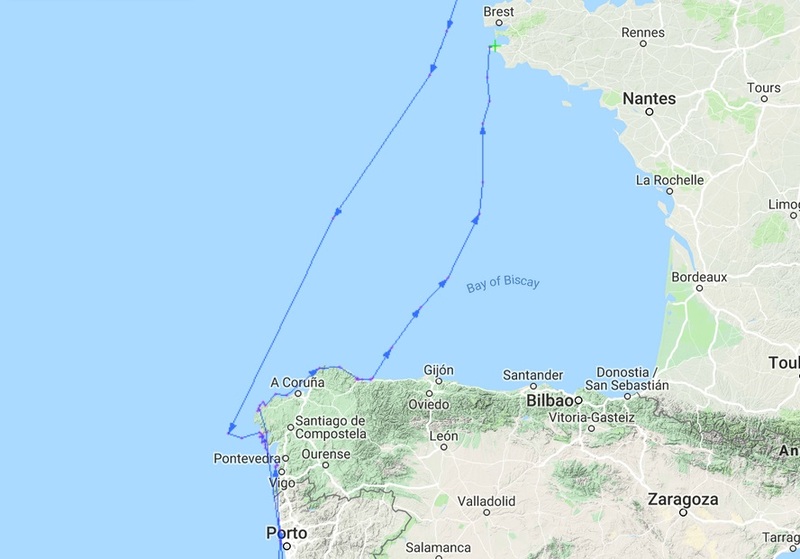 He reached the tip of France at Plogoff in Brittany round about midnight (a journey of roughly 12 hours) and was last picked up near Beuzec-Cap-Sizun at 0448 this morning. It’s looking like he may be our second gull to return home. Eric is from Pladda so it will be great to see what the next few days brings.